Trust. Not the only thing we build. Established in 1994, Leyendecker Homebuilders is locally owned and operated by Denis Leyendecker. Known for his honesty and strong work ethic, Denis places an emphasis not only on quality but also on availability to the homeowner, thus enhancing communication and ensuring satisfaction. Furthermore, Denis coordinates his own projects, so the homeowner speaks directly with him during the bidding, construction, and follow-up process. Denis makes visits to the jobsite nearly every day. It’s not unusual to see him helping his subcontractors—especially the carpenters, as he still has a passion for the hammer and nail. Denis personally communicates with his team of subcontractors to ensure smooth transitions form one subcontractor to the next as your project progresses through the different stages of building. Denis Leyendecker has woodworking in his blood: growing up around his father’s cabinet shop, building pole sheds as a teenager, then moving into home building. 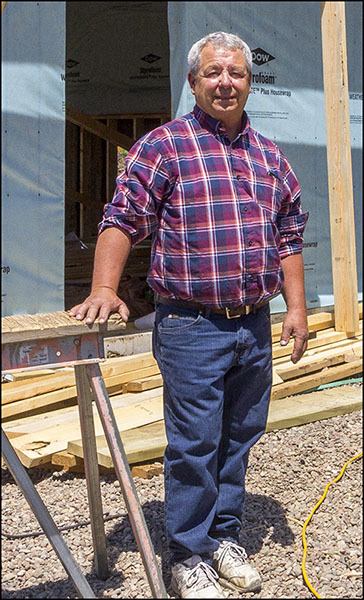 His carpentry skills have led him to being the hands-on general contractor of today. Denis is married and the proud father of four children, all of whom have contributed to the family business. Two of his children currently serve in the Marine Corps and Army. Denis and his wife Mary are watching their family grow, and currently boast of their six grandchildren.